I've seen this kind of thread done elsewhere before and thought it'd be quite cool to hear what you all sound like. As human beings spread out into isolated communities, stresses and peculiarities develop. Over time these can develop into identifiable accents. In North America, the interaction of people from many ethnic backgrounds contributed to the formation of the different varieties of North American accents. It is difficult to measure or predict how long it takes an accent to formulate. Accents in the USA, Canada and Australia, for example, developed from the combinations of different accents and languages in various societies, and the effect of this on the various pronunciations of the British settlers, yet North American accents remain more distant, either as a result of time or of external or "foreign" linguistic interaction, such as the Italian accent. And to give this a little more discussion, what are your favourite/least favourite accents? Do you like the accent you have? I'll get mine recorded once I get this mic sorted out. Went to the first showing last night at my local cinema and thought it was bloody brilliant. I'd heard good things about it in reviews and such but it surpassed any expectations i had. If you haven't heard about it, it's the new Quentin Tarantino film which follows a band of jewish-american soldiers, led by Aldo Raine (Brad Pitt), who're dropped into France with the sole mission of killing Nazi's and scalping them. There are various sub-plots, which come together at the end which give the Basterds the chance to end the war early. All i can really say without spoilers. Been a while since i've posted a rate this, here's my current stats with a little bit about my account's history. Started playing Rs around easter 2006 and played on and off till the start of 2007, when i got my own laptop and members and started to play more often. Decided to get my first 99 stat, hunter, in the summer holidays of 2007. This probably remains the thing i'm most proud of acheiving as it really felt like a proper "journey" to 99. Started at level 34 and took around two months to reach 99. After hunter, i just trained normally for a while before getting 99 cooking, which trimmed my hunter cape. Followed really closely by 99 thieving, which wasn't really a goal i had set out for but just kinda gradually happened. Fast forward to the start of this year when i acheived 99 firemaking, which must have kinda burnt me out as i haven't played nearly as much as i used to, although i did still enjoy playing when i did manage to find the time to log on. I haven't properly trained combat in ages, and at the moment, have no intentions to. 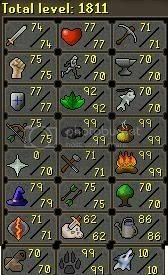 I enjoy skilling a lot more, as my stats probably show. Don't really have any goals set out at the moment, as i'm not playing nearly as much as i used to and with Uni starting in a few months, will have better stuff to occupy my time with. I'll probably find the time now and again to log in and will definatly still be on Tif, so i won't be completely gone. About me-I am Mcneil, usually called Mc for short. I am from bonnie Scotland and am currently working as a technician in an office complex. Other than Runescape, my main interest is music, listening to, playing and watching. I like to think i have quite a broad music taste (and am always looking for new stuff, so if you have anything you think is worth hearing...) but i have more Metal/rock artists than any other genre. Runescape- I started Runescape in 2006, a few weeks before the easter ring event. I then went on holiday and forgot all about Rs until a few months later (October i think) when i noticed it bookmarked and decided to go back to it. I played on and off until around March 2007 when i got my own computer and started to play a lot more and im still here yet, still enjoying it. I prefer skills to combat, as you'll be able to tell from my stats. Not much to see at the moment, may post one later. Everyone on my friend list, you know who you are. Thanks for putting up with me and helping with whatever daft questions i may ask. Everyone in Esc/Bsc/Codguy's chat for keeping me entertained. Tif and the Tip.it community. I would've packed Rs in a loooong time ago if i hadn't came here. Will try to update this blog as often as i can and it is still a "work in progress" so i'll be adding/removing sections quite a bit. If you could invite 5 people,dead or alive, to a party, who would it be and why did you choose them? What questions would you ask them? Is there anyone you definatly wouldn't invite? (1) John Bonham, (Drummer from Led Zeppelin). - Can think of hundreds of questions about Zeppelin i'd like to ask. (2) Bob Marley, (Reggae legend). - Great musician, would be good to get his views on the world today. (3)Jesus, (self explanatory). - What with being able to turn water into wine, the drinks would be taken care of. (4)Jean Reno, (Actor). - All round cool guy, favourite actor. (5) Colin McRae (Rally driver). - Got a few questions i'd like to ask him about his sport.